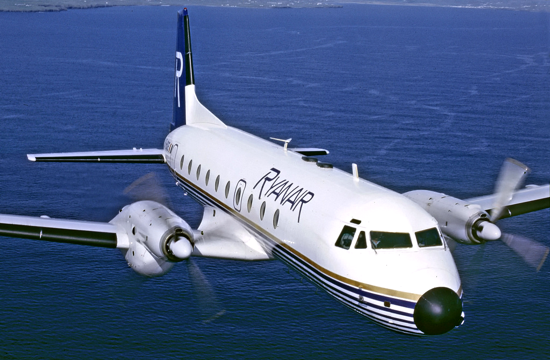 Features: Ryanair began operations on July 8, 1985 with daily flights on a 15-seater EMB 110 Embraer Bandeirante turboprop aircraft, from Waterford to London Gatwick. First cabin crew recruits must be less than 5ft. 2ins. tall in order to be able to operate in the tiny cabin of the aircraft. 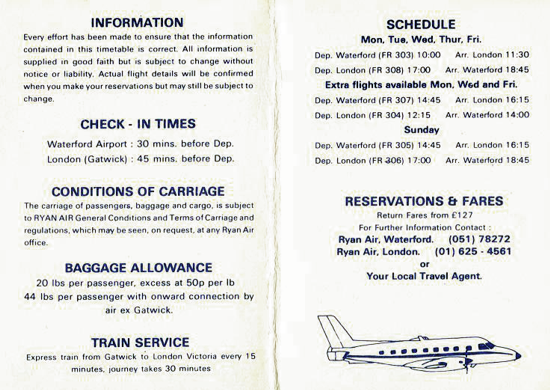 The 90-minute flight, Waterford's first international scheduled air service, departed at 8.30am, with the return flight departing from Gatwick at 7pm. On May 23, 1986 Rayanair launched a second route Dublin - London Luton, operated by two 46-seater BAE748 turboprop aircraft. Interesting facts: In 1975, Irish businessman Tony Ryan founded Guinness Peat Aviation (GPA), a commercial aircraft sales and leasing company based in Shannon, Ireland. During the 1980s the company became the world's largest commercial aircraft lessor, but in early '90s economic depression undermined this commercial success, the company over-reached itself, and in 1992 it ran into debt problems. 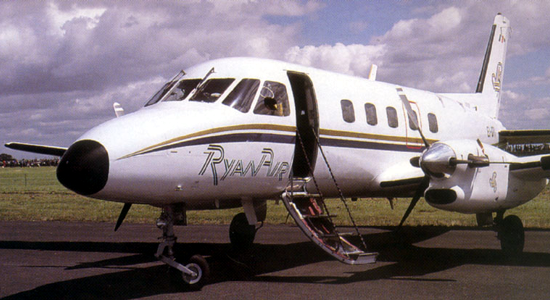 Ryan lost control of the company; however, in 1985 he had already launched a little airline, Ryanair (named after him), with co-founders Christopher "Christy" Ryan, godfather to Tony's second son Declan and worker at GPA on the sales team, and Liam Lonergan, owner of Irish travel agent Club Travel. 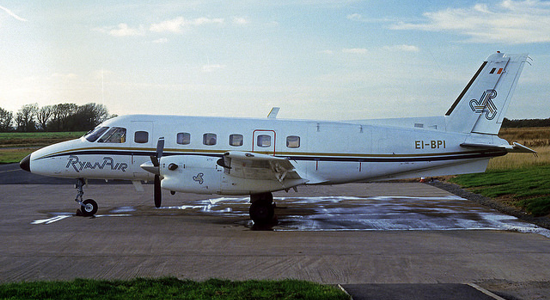 With a share capital of just £1, and a staff of 25, they began to charter a 15-seater aircraft to bring small groups on business and leisure trips between Waterford and London Gatwick. 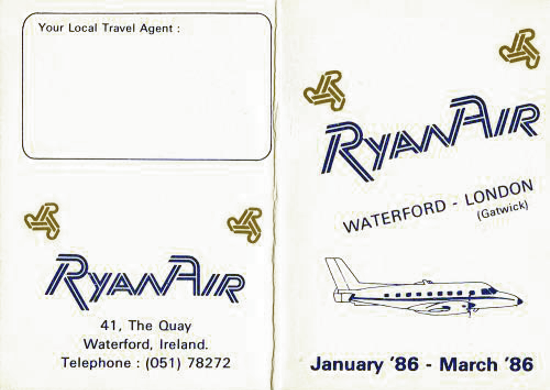 In 1986, Ryanair obtained permission from the regulatory authorities to challenge the British Airways and Aer Lingus' high fare duopoly on the Dublin-London route; services were launched with two 46-seater aircraft. The launch fare of £99 return was less than half the price of the British Airways and Aer Lingus lowest return fare of £209. With two routes in operation, Ryanair carries 82,000 passengers in its first full year in operation. Thirty years later, in 2016, Ryanair was the largest European airline by scheduled passengers flown, and carried more international passengers than any other airline. Ryanair, first aircraft operated by the company (July 8, 1985). 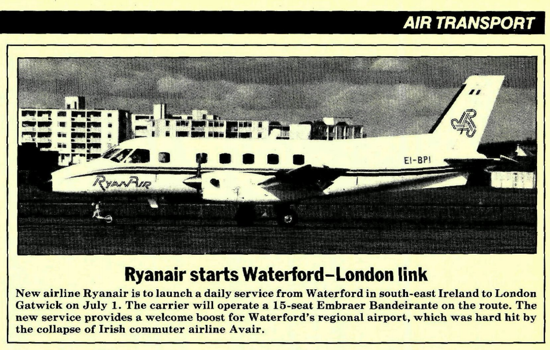 Ryanair's first route Waterford - London Gatwick was operated by a 15-seater EMB 110 Embraer Bandeirante turboprop aircraft. 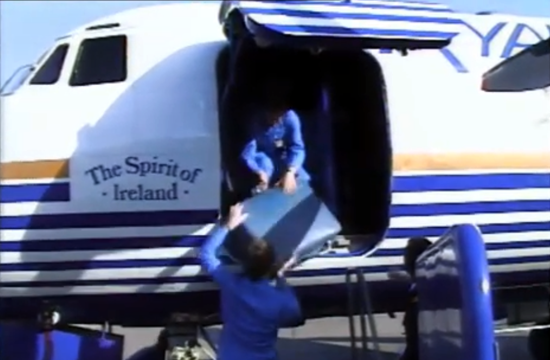 Ryanair inaugural flight - video (July 8, 1985). Click the image to see the clip (1 min.) archived by RTÉ.ie, Raidió Teilifís Éireann, Ireland's National Public Service Broadcaster. Ryanair, second aircraft operated by the company (May 23, 1986). Ryanair's second route Dublin - London Luton was operated by two 46-seater BAE748 turboprop aircraft, known as "The Spirit of Ireland". Ryanair founders: Christopher "Christy" Ryan (left), Thomas Anthony "Tony" Ryan (center), and Liam Lonergan (right). 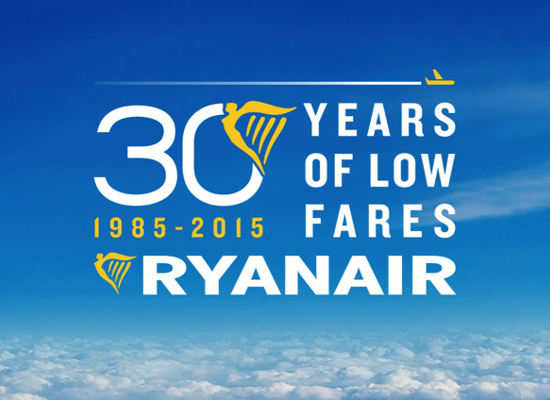 Ryanair 30th Anniversary (1985-2015). 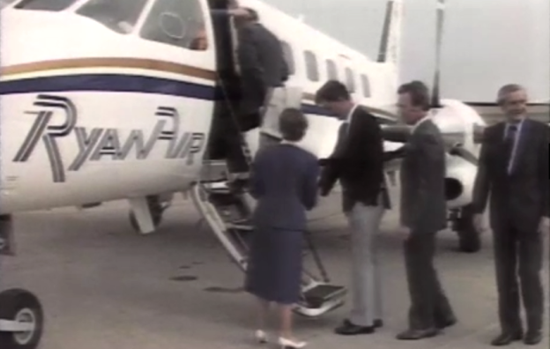 Ryanair celebrate 30 years looking back at travel with Ryanair in 1985 compared to 2015.